Vision Panels and the Codes – Did you know that unless a vision panel is fire resistive and impact safe, it cannot be larger than 100 square inches? It is no longer true that if you have sprinklers you can make larger vision panels. What’s an easy way to save money and create safer schools? Just add glass. The challenge is finding glass that provides the most benefits and meets the codes. Tapping into daylight through interior windows, corridor skylights, and vision panels in and around doors contributes to student safety and energy efficiency. Studies also correlate natural lighting to increased student performance. 715.4.4.1 Glazing In doors. Fire protection rated glazing in excess of 100 sq inches (0.065 square inches) is not permitted. Fire resistance rated glazing in excess of 100 sq inches (0.065msquare inches) shall be permitted in fire door assemblies when tested as components of the door assemblies, and not as glass lights, and shall have the maximum end temperature rise of 450 degrees F (250 degrees C) in accordance with 715.4.4. Exception: The maximum transmitted temperature end rise is not required in buildings equipped throughout with an automatic sprinkler system installed in accordance with Section 903.3.1.1 or 903.3.1.2. “The presence of sprinklers isn’t enough insurance when it comes to saving lives. We need balanced fire protection. Fire-rated glass plays an important role in providing both active and passive protection. Fire resistive glass products can provide the same protection as a solid wall,â€ said William F. O’Keeffe of SAFTIFIRST, in testimony before the International Code Council. The code council agreed with Mr. O’Keeffe and changed the code. ADA section 404.2.11 requires that at least one of the vision panels in a door and sidelites adjacent to a door be no more than 43 inches (1090 mm) above the floor line to provide visibility and safe access for all. Vision panels exceeding 100 square inches in 60 and 90 minute doors require fire resistive glazing. The resistive glass requirement applies to sidelites and transoms as well. Wired glass and ceramic products are fire protective rather than fire resistive products. This means that they fail to block the transmission of radiant heat, so their size in vision areas must be limited. In order to have vision areas in doors and sidelites in exit enclosures and exit passageways large enough to be within 43 inches of the floor line, the 2012 IBC requires this glazing to be fire resistive rather than fire protective. 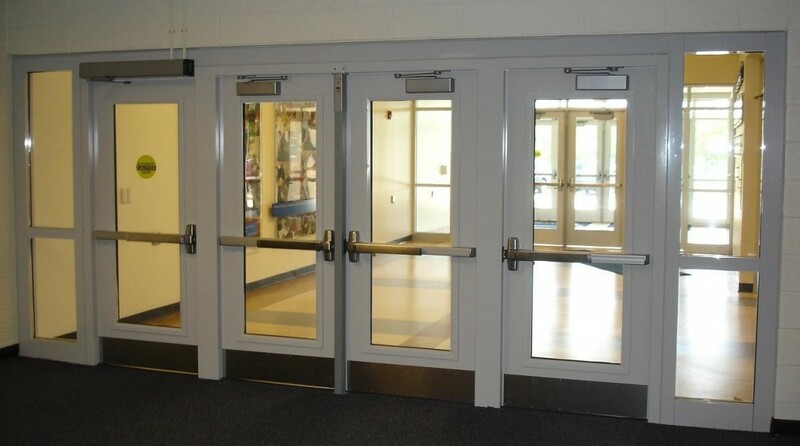 The door assembly (sidelites, transoms, doors) pictured meets both the new 2012 IBC and ADA requirements for vision areas located in exit enclosures and exit passageways. These large, fire-resistive vision areas are made possible by the application of SuperLite II-XL 60 in HMTR Doors and SuperLite II-XL 60 in GPX framing in sidelites.